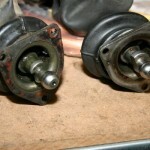 Here is a collection of information relating to early Mitsubishi manual RWD gearboxes. As there is a lot of conflicting information around and not many cars have the same engine/gearbox that they left the factory with, I have tried to include all of the information required to identify what type of box you should use and how to distinguish that box from other similar boxes. There are two brands of manual gearboxes used in early Mitsubishi’s, Borg Warner and MMC (commonly referred to as the Jap or Japanese box). They are easily distinguished as the Borg Warner has a separate bell housing which can be removed whilst the Jap gearbox is one piece. All Lancers and Galants came with the Jap box, in either four or five speed configuration, whilst Sigmas and Scorpions came with both the Borg Warner and Jap box. If you are swapping an Astron engine into a Lancer or Galant, it is advisable to use an engine and matching Jap box as they will easily fit where the Borg Warner requires changes to the gearbox mounts and tailshaft. Whilst there is no real evidence to back this up, the pick of the gearboxes is the Jap box, is has a reputation of being stronger and having a better feel to use. With the limited number of gearboxes I have used, I would have to agree. A common issue when swapping gearboxes, is the compatibility between different gearboxes is the difference in the bolt pattern where the engine and gearbox mate together. They are commonly referred to as either a wide or narrow block and you need to ensure that the gearbox and engine block are the same size. The Borg Warner box comes in both sizes, however, if you have a good gearbox that has the wrong bell housing size, you can swap the bell housing over. The Jap box also comes in wide and narrow sizes as well as a dual size that will fit both the wide and narrow blocks. Below are some general rules as to the origin of each size, however, please ensure you check the size before you try to swap anything over. When swapping Jap boxes between cars there can be a noticeable difference in length, from the information I have gathered, this is entirely due to the length of the extension housing and the length of the main gearbox assembly is identical between different models. As the ability for a gearbox to handle power is dependent on the gear widths (as well as other factors) I have been trying to gather the widths of the gears in different boxes. At the moment, I only have the information for the Borg Warner box. Another potential issue with swapping gearboxes is that the 4 speed and 5 speed shifters in the Jap boxes are different. The 4 speed shifter will not work in the 5 speed, however I believe that the 4 speed shifter will work in a 5 speed gearbox (I have not tested this as I do not need a 4 speed gearbox). 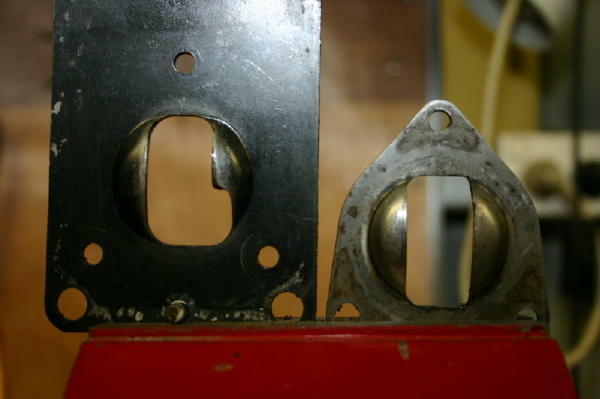 As you can see, there is a substantial difference just above the bottom ball, as there is material in different locations, they cannot be modified to be used in other gearboxes. The second photo (click on the photo for a larger image to open in a new window) shows the shifter guide plates with the 5 speed on the left and four speed on the right. Please note that the plates came of two different styles of Jap gearbox with different shifter extensions, hence the overall design is larger on the 5 speed. 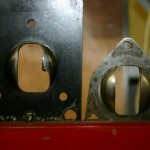 The main area to look at is the hole in the centre. 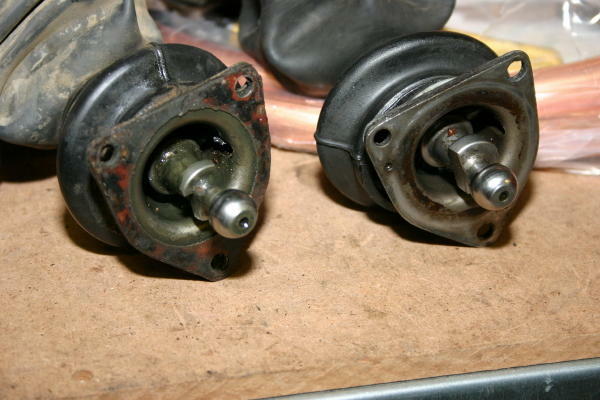 It is possible to modify the 4 speed to be used on the 5 speed gearbox as apart from the extra material removed on the 5 speed, they are identical. Different engines come with different flywheel sizes, the smallest in the 1.4 litre 4G33 engine and the largest in the 2.6 litre 4G54 engine. When swapping gearboxes it is important to use the flywheel that matches the gearbox, this ensures that the starter motor and clutch will fit correctly. If you use a smaller flywheel, then the starter motor will not touch the ring gear on the flywheel properly whilst a larger flywheel may not fit in the bell housing at all.